We hope you had a very Happy Thanksgiving. In the past we have put our Christmas tree up the day after Thanksgiving. This issue has been quite the challenge. familiar with. Hopefully I will have better luck with the next issue. Thank you for being patient... now I can put up our Christmas tree! THROUGH WHICH MEN SEE FAR INTO HEAVEN." Behold, children are a gift of the Lord; the fruit of the womb is a reward. Like arrows in the hand of a warrior, so are the children of one's youth. How blessed is the man whose quiver is full of them; they shall not be ashamed, when they speak with their enemies in the gate. And they were bringing children to Him so that He might touch them; and the disciples rebuked them. But when Jesus saw this, He was indignant and said to them, "Permit the children to come to Me; do not hinder them; for the kingdom of God belongs to such as these. Truly I say to you, whoever does not received the kingdom of God like a child shall not enter it at all. And He took them in His arms and began blessing them, laying His hands upon them. It is for discipline that you endure; God deals with you as with sons; for what son is there whom his father does not discipline? But if you are without discipline, of which all have become partakers, then you are illegitimate children and not sons. Furthermore, we had earthly fathers to discipline us, and we respected them; shall we not much rather be subject to the Father of spirits, and live? For they disciplined us for a short time as seemed best to them, but He disciplines us for our good, that we may share His holiness. All discipline for the moment seems not to be joyful, but sorrowful; yet to those who have been trained by it, afterwards it yields the peaceful fruit of righteousness. HELP THEM SHINE FOR CHRIST." do not desire his _________. This method of crochet is called BROOMSTICK LACE. I've also seen it called Jiffy Lace. Broomstick Lace is done with a large knitting needle or broomstick... I made mine from a real wooden handle. I cut it in half and used hubby's Swiss Army Knife to whittle a point on one end then used sand paper to smooth it. Wrapped a rubber band around the flat end to ensure my stitches wouldn't fall off and started crocheting. 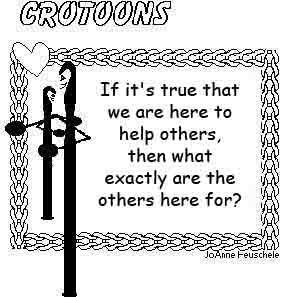 You use a crochet hook to form the loops one at a time and place them onto the broomstick needle. Loops are worked off of the broomstick needle by removing them in sets and crocheting into them. Broomstick lace can be altered to suite your taste. Instead of doing 4 loops per section you might want to do 5. Use your imagination. Just remember... if you pull off 4 loops (like in the square pattern) you must do 4 stitches into those loops. If you pull off 5 loops you must do 5 stitches into the loops, etc. When working with two colors of yarn in a project the yarn strands tend to twist and tangle as you switch colors. To help tame this problem place the yarn in a plastic basket and sit the basket on a kitchen turntable (like this). As the yarn gets twisted, rotate the turntable to untwist it. across an abreviation for a stitch in baby bootie patterm. It's a first for me! but I did an end of round count and if I decrease my count doesn't come out right. 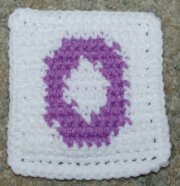 Dhdc is not a common crochet stitch abbreviation. When you need to decrease stitches you work each of the stitches for the decrease without completing the very last step of the stitch, then you yarn over and draw through all of the loops. 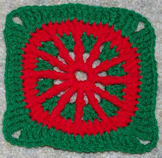 I was looking at your Christmas Tree coaster and could not figure out the pattern. The gray background is also crochet? is it stich to some material? How is that goes? Please let me know because is too cute and I want to make it. not part of the pattern... the tree shape is the coaster. Hi I am looking for an angel crochet pattern that I am sure I got from your website. It was about 2 ½ inches long made out of lustersheen and a 1’ inch plastic ring. I just cant find it and I really need it because I am going to make Christmas angels. I think I understand the first part but after the parentheses I don't know what that means. It is working in a circle, if that makes more sense. 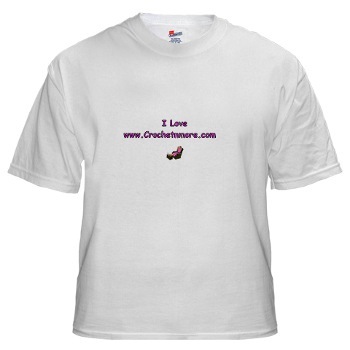 Thank you very much for your help, and let me just say that your website is certainly the most informative that I've come across for crochet information. 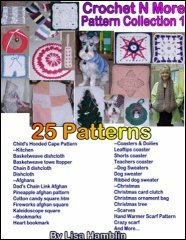 I greatly appreciate the tips and your how to read a pattern section has help me numerous times in the past. place that double crochet in the same stitch... just beneath those 4 chains. with a chain in the center of the top of the V.
Wonderful pattern. You are so talented! 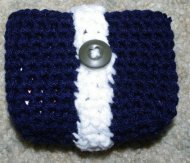 I can crochet anything I want but have no imagination to try to create anything. I like to make things like this for Christmas gifts. Hope that is ok by you and I will put a note with it with your name as the one who made the design. They may want to look you up. so others could understand them . 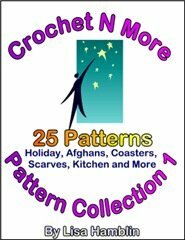 I allow items made using my patterns to be given as gifts OR to sell for a profit. my patterns please share the URL to my site (www.crochetnmore.com). Thank you for including my name with your items also... that’s very thoughtful of you. On the shrug pattern for dogs, 'special stitches',dtr, and qtr, the directions were a little confusing until I read your directions for a dtr. Now I have to undo and redo. I was just doing a dc. Rats. I did not see in your list a qtr. Your directions are easier. Or so it seems. [yo] (5) times, insert hook in stitch and draw up a loop, [yo and draw through 2 loops] (6) times - 1 loop is left on hook. It still doesn't seem very clear but I can try. Is that correct with you? Your directions are very good and simple to understand. Oh, and how do you work with two stands held together as one throughout, if you are using 1 skien? I find this very confusing because the materials for this shrug calls for only one skien of the color I will be doing the next one with. No flower; he's a he. Anywho... FYI: I didn't see the qtr stitch on your list. Hope you have a blessed holiday season filled with joy and peace. one skein but I always just work from both ends of the skein at once. I will add qtr to my list of stitches... thanks for letting me know I didn’t have this one listed. I just had to drop you a note to tell you this is the cutest hat and bootie set I have ever done. I have gotten so many comments about how adorable they are. Thank you for sharing the pattern with us. I didn’t find an error, but I am incredibly experienced, and I don’t quite understand the instructions for R2…I got through R1 just fine, but any extra help you could provide on R2 would be greatly appreciated! For R1 you chain 29. Work a double crochet, one chain and another double crochet all in the next chain. Skip the next chain. Work one double crochet in each of the next two chains. Now repeat from the asterisk across the rest of the row. For R2 you chain 3 and turn. Work one double crochet in the next double crochet. all in the next chain one space (the hole below the chain). Work one double crochet in each of the next two double crochets. Keep repeating R2 until the scarf is as long as you want it. I have a pattern that I don't understand a step I did see in your list. It will say, ch 3, then right after that, ch 1 and the next step for the stitches. Why doesn't it just say chain 4? Isn't that what you'll end up doing with the instruction above? I'm getting ready to give up on this pattern. So many directions that don't make sense or I don't know what it means. there’s a chain 1??? I agree with you... I would just write Chain 4. The guy said, "Well, I got here as fast as I could." internet . . . "
Taking advantage of a pause in the student's litany, the senior said, "You're right sonny. We didn't have those things when we were young. So we invented them!" nervous disorders require prompt and regular attention? What's your excuse?" associate e-mailed technical documents asking me to "decifer"
them, I had to set him straight. forgotten, spell checker comes free with your Microsoft program." A minute later came his reply: "Must be dephective." couldn't take it any longer. told his mother the lens was nowhere to be found. the contact lens in her hand. "How did you find it, Mom?" the teenager asked. were looking for a contact lense. I was looking for $150." latest kind of "Painless" dentist. But a local lad quickly disputed this. my mouth I bit him - and he yelled just like anyone else!" Why do they put pictures of criminals up in the Post Office? so the mailmen can look for them while they deliver the mail? was exempt, because of her age. "I've already done that," she replied. "I did it last year." "Do you think I'm going to get younger?" Little Johnny sat playing in the garden. she saw that he was slowly eating a worm. She turned pale. "No, Johnny! Stop! That's horrible! You can't eat worms!" for her nice baby worm." "No, she isn't," said Johnny. "How do you know she's not?" "Because I ate her first!"